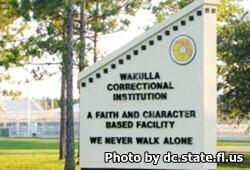 Wakulla Correctional Institution and Annex is located in Crawfordville Florida. It is a level V facility that can house approximately 1,532 male adult inmates of minimum, and medium custody levels. Educational opportunities for inmates include adult basic education, literacy courses, creative writing, small business concepts, computer and software courses, and GED classes. Inmates can also take vocational courses including basic electrical concepts, home improvement, drafting and CDL theory. Offenders can also participate in substance abuse treatments such as Alcoholics and Narcotics Anonymous and obsessive compulsive behavior recovery. The Chaplain's office offers a large variety of religious based programs, and self improvement courses that include re-entry programs are also made available to inmates. To visit an inmate you must first fill out a visitors application. Visiting is held on Saturdays and Sundays from 9am-3pm Eastern Standard Time. Registration for visiting begins at 8:15am and ends at 2pm. If you do not arrive and register by 2pm you will not be allowed to enter into visitation.